I am so obsessed with these cupcakes (not to mention that I think I am becoming an insomniac) that I had to blog about them RIGHT NOW!!!! My friend from school asked me to make them for a baby shower tomorrow and after looking at lots of pictures, we decided on some very cute green and yellow chocolate cupcakes! I have never done ligit fondant covered cupcakes before and I was glad for the chance. I baked some chocolate cupcakes yesterday and molded the fondant things this afternoon so they could dry a bit before I did the assembly. I got home late from being with friends, but I just was so excited that I had to make up some frosting and put them together tonight. I think the brown chocolate frosting looks great with the pale green and yellow! Mindy - thanks for ordering these!!!! The most exciting part of these cupcakes was making the BABY letter decorations. I have been wanting to do this FOREVER, but just never had the guts or something like that. I bought this rubber stamp thing, I think it is used for stamping paper and stuff. It is just a thin sheet of rubber. 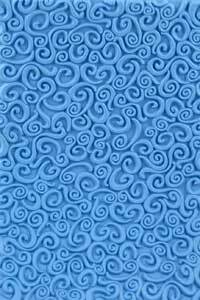 Mine looks like this and can be bought at Joann's or at http://www.polyclayplay.com/Cart/products/Rubber-Stamps-%252d-Curls.html. This website is awesome and has lots of other cute patterns. So I rolled out my fondant pretty thick, made sure it was brushed with a little powdered sugar, then pressed this stamp in. It covers about 6x4 inches so I then used that area to cut out little scalloped circles using a cookie cutter. I let these dry on some waxed paper and then wrote on them with white royal icing. I am in love. Another equally exciting thing about this project are my new cupcake boxes, as observed above. They are so secure and sharp looking. Not to mention totally practical and I even got them cheap in Phoenix. Yes... I am very excited! so cute! i love the little feet! I am exciiiiiiiiiiited. Great cupcakes. I know this isn't the amazing part, but I think the chocolate frosting looks SO good. Give me a spoon and a temporary reprieve from my diet, and I'll be in heaven! These are wonderful. Now I just need to get pregnant. I'm with Andy, now I just need to have a baby! :) You are amazing Ashley, these are super cute. Thanks so much y'all! I need to make more stuff so I can hear your sweet compliments! WOO!!!! Fondant stamping!!!!!!!! Fiiiiiiiinally!! :) Turned out cuter than my wildest imaginings! !